The World Games in Wroclaw proceeded with the rhythmic gymnastics event, where the gymnasts were watched only by their teammates and coaches. Fans wanted to watch the event, too, but most of the broadcasting channels were either restricted to a handful of countries, showing other sports or only broadcasting a couple of performances. If, as things are, the people of Poland have bigger fish to fry than to watch sports, then perhaps the World Games should take place somewhere else. The World Games are not limited to gymnastics either; they cover many other sports. The competition itself I will refrain from discussing. The air conditioner was either off or blowing off ribbons and hair pins, and the judging was stranger than ever. 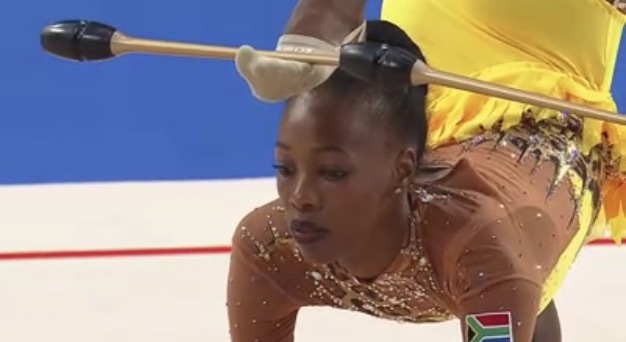 But, to keep up a good mood, I will comment that the two gymnasts with longest legs and super model bodies, Grace Legote from South Africa and Olena Diachenko from Ukraine both competed in one event which does not happen often. In fact, it is rare to watch someone so beautiful. I snapped some shots from the limited broadcast on one of the Russian channels. Olena "had better do better" next time, this picture seems to be saying.